I looked for a detailed document about ME51N-ME52N-ME53N add custom field in SCN but i have not found fully described. That’s why i decided create this blog. Some customers need to add custom fields for their purchasing request documents then try to copy this field other subsequent purchasing documents such a purchase order. You can benefit from this blog for these requirements. I suggest that please read MEREQ001 enhancement document ! 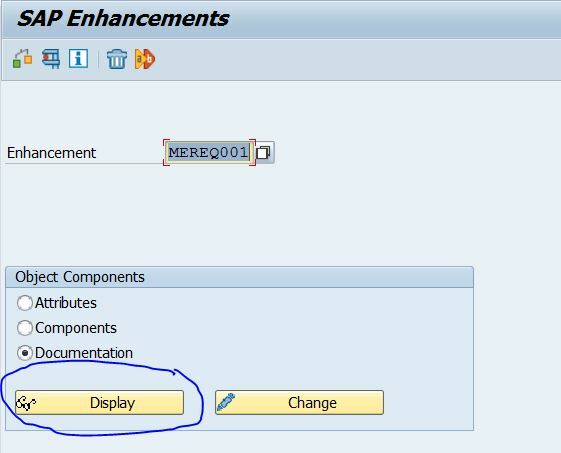 Because, SAP inform you how to design your developments step by step. 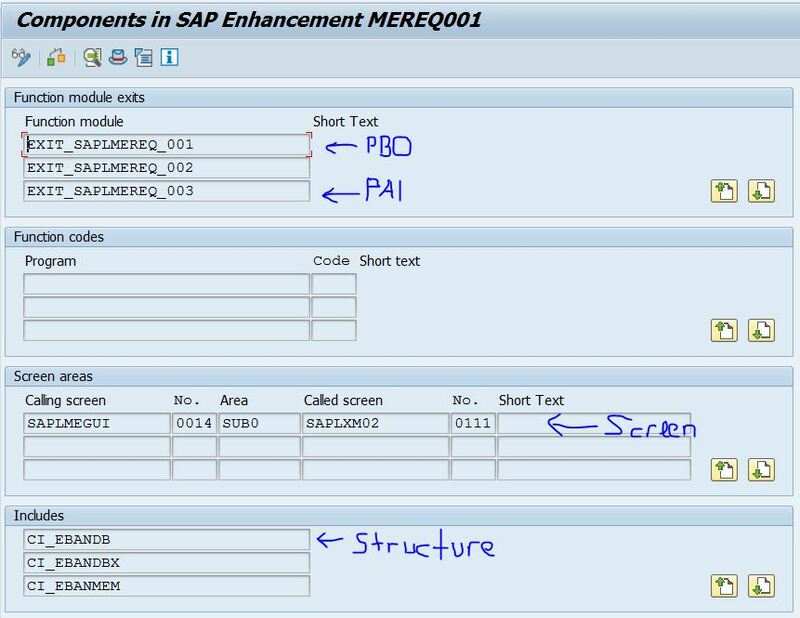 When you finish explainations of SAP , you will get information about this user-exit. 1- Append your custom field to CI_EBANDB . 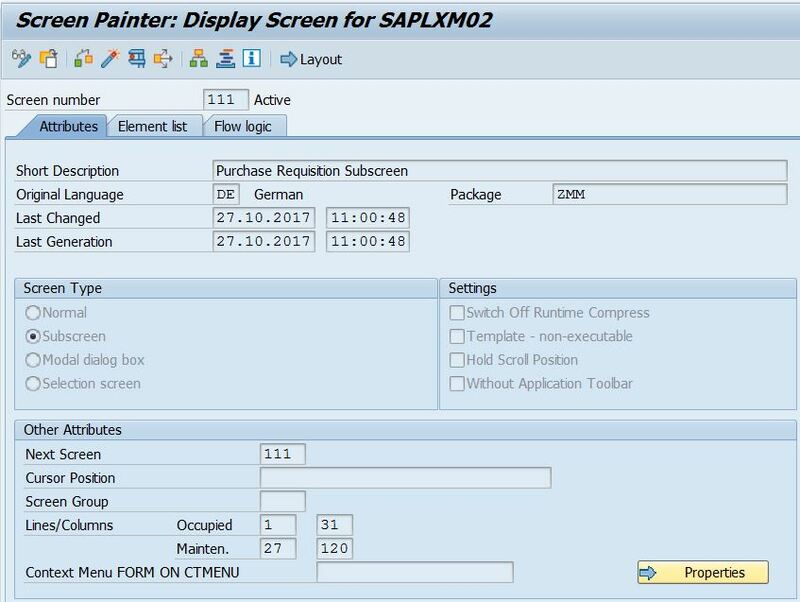 2- Create subscreen and add custom field to screen number 111. 5- If you get DUMP like a –> Runtime error : DBSQL_SQL_ERROR , Exception : CX_SY_OPEN_SQL_DB., go to SE14 for EBEV then ‘Adjust and activate’ ! I created a project for implementation in CMOD named ZMM and MEREQ001 is added such a component. Then you can work on it. 1- Add ZZUSER to CI_EBANDB . 2- Create subscreen and fill out modules. *----------------------------------------------------------------------* *& Module STATUS_0111 OUTPUT *&---------------------------------------------------------------------* * text *----------------------------------------------------------------------* MODULE status_0111 OUTPUT. */ M.Ozgur Unal - 26.10.2017 - SP IT *& ZXM02U01 include dan gönderildi. IMPORT flag_input FROM MEMORY ID 'Z_FLAG_INPUT_ZXM02U01'. LOOP AT SCREEN. IF screen-group1 = 'ZPR'. IF flag_input = 'X'. screen-input = 1. ELSE. screen-input = 0. ENDIF. MODIFY SCREEN. ENDIF. ENDLOOP. ENDMODULE. *----------------------------------------------------------------------* *& Module CHECK_ZZUSER INPUT *&---------------------------------------------------------------------* * text *----------------------------------------------------------------------* MODULE check_zzuser INPUT. */ M.Ozgur Unal - 26102017 - SP IT DATA : ls_zfi_tek_ony TYPE zfi_tek_ony. CHECK NOT ci_ebandb-zzuser IS INITIAL. SELECT SINGLE * FROM zfi_tek_ony INTO ls_zfi_tek_ony WHERE zzuser EQ ci_ebandb-zzuser. IF sy-subrc IS NOT INITIAL. MESSAGE e163(zmm). ENDIF. ENDMODULE. Note : I did not fill out user_commad_0111 so that there is no details ! 3- Development for EXIT_SAPLMEREQ_001 –> INCLUDE ZXM02U01 . *&---------------------------------------------------------------------* *& Include ZXM02U01 *&---------------------------------------------------------------------* */ M.Ozgur Unal - 261017 - SP IT DATA : ls_mereq_item TYPE mereq_item. DATA : cur_activity TYPE aktvt. * clear eban values if no PReq item IF im_req_item IS INITIAL. CLEAR: ci_ebandb. ELSE. * read item data from system ls_mereq_item = im_req_item->get_data( ). * fill customer field with old values ci_ebandb-zzuser = ls_mereq_item-zzuser. ENDIF. CALL METHOD im_req_item->get_activity RECEIVING re_aktvt = cur_activity. CASE cur_activity. WHEN 'A'. flag_input = space. WHEN 'V'. flag_input = 'X'. "Modify ENDCASE. * MEREQ001 Enh customer sub screen de kullanılacak. FREE MEMORY ID 'Z_FLAG_INPUT_ZXM02U01'. EXPORT flag_input FROM flag_input TO MEMORY ID 'Z_FLAG_INPUT_ZXM02U01'. 4- Development for EXIT_SAPLMEREQ_003 –> INCLUDE ZXM02U03 . *&---------------------------------------------------------------------* *& Include ZXM02U03 *&---------------------------------------------------------------------* */ M.Ozgur Unal - 261017 - SP IT DATA: l_mereq_item TYPE mereq_item, eban TYPE eban, l_aktvt TYPE aktvt. IF NOT im_req_item IS INITIAL. " read item data from system l_mereq_item = im_req_item->get_data( ). l_aktvt = im_req_item->get_activity( ). IF l_aktvt EQ 'A'. ELSEIF l_aktvt EQ 'V' OR l_aktvt EQ 'H'. IF l_mereq_item-zzuser NE ci_ebandb-zzuser. l_mereq_item-zzuser = ci_ebandb-zzuser. ex_changed = 'X'. ENDIF. IF ex_changed = 'X'. CALL METHOD im_req_item->set_data( l_mereq_item ). ENDIF. ENDIF. ENDIF. EBAN is updated correctly ! I hope that you will need to copy custom fields to subsequent documents such a purchase order. You have to add same field to subsequent purchasing document and fill out fields in subscreen referance to purchase requisition. 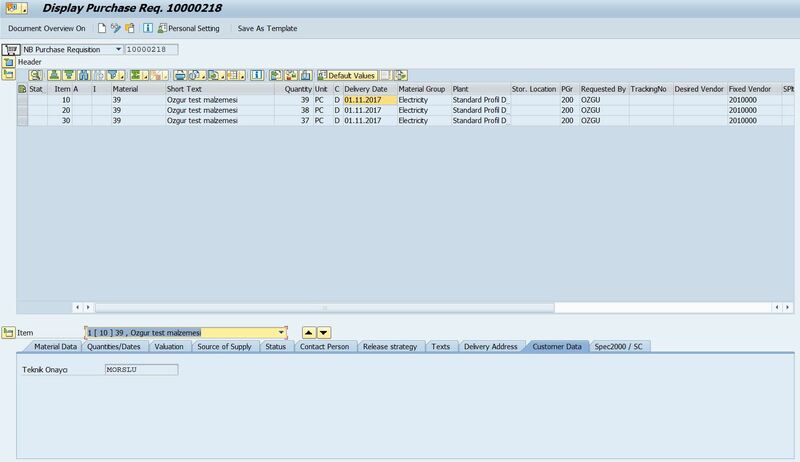 Enhancement IMP –> MM06E005 Customer fields in purchasing document . Read custom field PR . IF i_aktyp EQ 'H' OR i_aktyp EQ 'V' SELECT SINGLE zzuser FROM EBAN INTO @DATA(wa_eban) WHERE ebeln = ekpo-ebeln AND ebelp = ekpo-ebelp. IF sy-subrc IS INITIAL. gs_ci_ekpo-zzuser = wa_eban-zzuser. ENDIF. ENDIF. 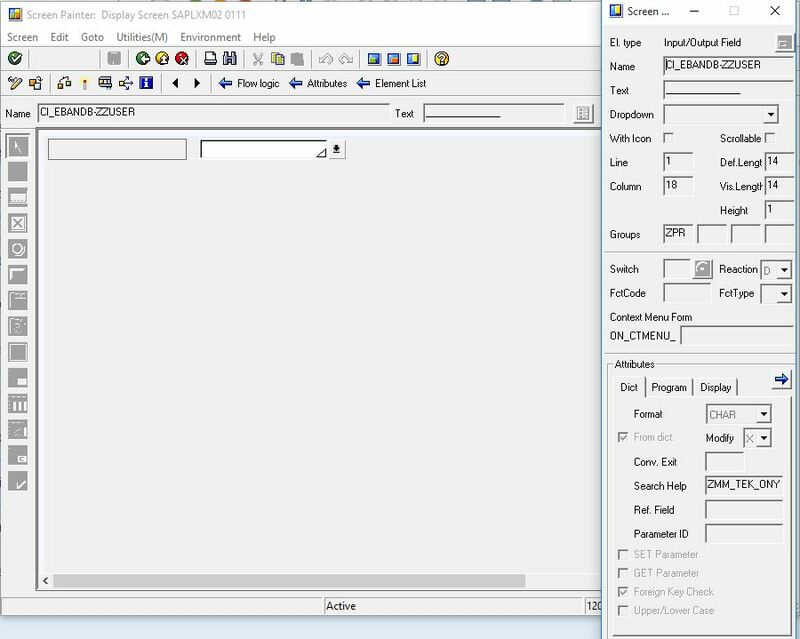 Next Barcode or QR code scanning functionality into SAPUI5 applications.